Lasers have the potential applications in the field of endodontics mainly for their effectiveness in antibacterial action and smear layer removal. ,,,, Diode lasers have got good depth of penetration inside the dentinal tubules (500 μm) compared to chemical solutions (100 μm). ,, To date, the potential application of 940-nm diode laser energy in endodontics has seldom been addressed except for its application in the disinfection of the root canals after endodontic instrumentation. Hence, the aim of this in-vitro study was to investigate the ultra morphological changes of the root canal dentin after irradiation with 940 nm diode laser along with 2.5% NaOCl and 17% EDTA irrigation, using scanning electron microscope (SEM) and energy dispersive X-ray spectroscopy (EDX). Ethical clearance was obtained from the institutional review board, Manipal University, India. Ten freshly extracted human mature permanent mandibular premolar teeth were selected from the age group of 16-25 years. All the teeth were radiographed to verify the presence of single canal, mature apex and absence of any resorption or endodontic obturation. The teeth with caries, cracks and dilacerations were excluded. The soft-tissues were removed from the root surface by a soft brush and teeth were stored in 0.2% sodium azide (Sigma Chemical Co, St. Louis, MO) at 4°C until the experiment. Teeth were then decoronated using a low-speed diamond disc (Diatec, Swiss Dental, Switzerland) to obtain a uniform root length of 14 mm. The pulp tissue was extirpated using barbed broach and the working length was established by inserting a No. 10 K file (Mani Inc-Tochigi Ken, Japan) into each root canal until it was just visible at the apical foramen (observed under magnifying loupes) and by subtracting 1 mm from this point. Root apices were then closed with sticky wax to simulate the closed end model. Cleaning and shaping was performed using protaper rotary system (Dentsply-Maillefer, Ballaigues, Switzerland) and the canal was enlarged up to F3 size. Irrigation was performed using a 27 gauge side vented needle (Appli Vac, Vista Dental Products, USA). The needle was placed within 1-2 mm of the working length in each canal. Canals were irrigated with 2 ml of 2.5% NaOCl (KMC Pharmacy, Manipal, India) for 1 min between each instrument change. After instrumentation, canals received a final flush of 5 ml of 17% EDTA (Merck, Darmstadt, Germany) for 1 min. This was followed by a flush of 5 ml of distilled water for 1 min to remove any remnants of irrigating solutions and the canals were dried with sterile paper points (Dentsply-Maillefer, Ballaigues, Switzerland). All the prepared teeth were then longitudinally grooved using a diamond disk (Diatec Swiss Dental, Switzerland) to obtain a total of 20 halves. One-half of each tooth (Group A) (n = 10) was analyzed without laser irradiation and other half (Group B) (n = 10) was analyzed after irradiation with 1.5 W continuous wave of 940 nm diode laser (Ezlase Biolase, San Clemente, CA). Tooth preparation and irrigation was performed by a single operator. Samples from both groups A and B were irrigated with 5 ml of distilled water for 1 min and subsequently dehydrated at 120°C in a hot air oven for 30 min. Specimens were then mounted on aluminium stubs, sputter-coated with gold and introduced into the vacuum chamber of a SEM (LEO 440i, Tokyo, Japan). 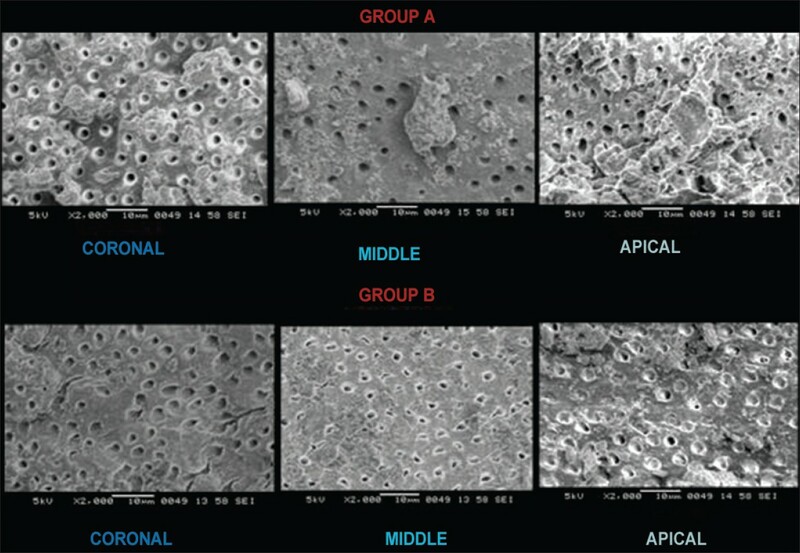 Photomicrographs of the root canal walls were taken at 2 mm, 7 mm, and 12 mm from the apex representing the apical, middle, and coronal regions at 2000× [Figure 1]. The photomicrographs were evaluated by two independent evaluators who were unaware of the experimental groups to which the samples belonged. To guide examiners during morphological and ultra-structural analyses, scores were established based on images obtained under the SEM. The amount of smear layer was graded between 1 and 4. EDX analysis of the same samples was done under EDX analyzer (Oxford Inc, Concord, MA, USA) to assess the Ca, P and magnesium content and to determine the Ca P ratio. Scoring criteria for the presence or absence of smear layer done with modified criteria of Rome et al. Score 1: Clean root canal wall with complete absence of smear layer; all dentinal tubules open and clean. Score 2: Minimal amount of smear layer; more than 50% of the dentinal tubules open. Score 3: Moderate amount of smear layer; less than 50% of dentinal tubules open. Score 4: Heavy smear layer with complete obliteration of dentinal tubules. Wilcoxon signed rank test was used to evaluate the smear layer score and paired t-test was used to evaluate the mineral content. P < 0.05 was considered statistically significant. 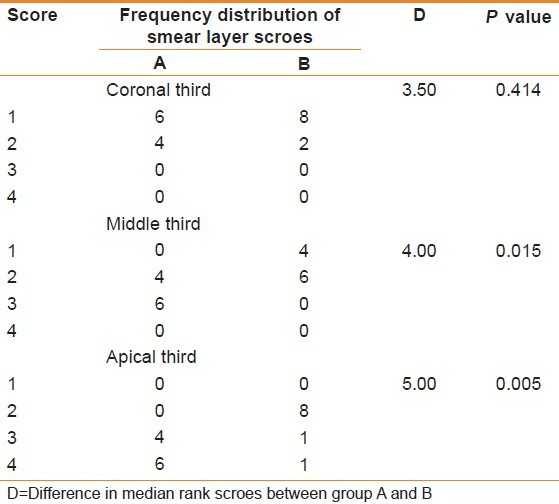 The frequency distribution of the scores for smear layer, the difference in mean rank scores between group A and B are presented in [Table 1]. Examination of the surface of the root canals revealed that, at middle (P = 0.015) and apical thirds (P = 0.005) smear layer removal was better with laser irradiated group [Table 1]. However, in the coronal third there was no statistically significant difference in removal of smear layer between both the groups (P = 0.414). The mean Ca, P, magnesium content and the Ca phosphorous ratio are presented in [Table 2]. There was a mild variation in values when both group A and group B were compared but the difference was not statistically significant. The result of the present study is in accordance with a previous study by Marchesan et al.,  in which 980-nm diode laser irradiation of root canal dentin showed ultra-morphological changes ranging from smear layer removal to dentin fusion. However, in their study, lava melting was seen on the dentinal surface unlike in this study, which could be attributed to use of higher power of 3 W (pulsed mode) and laser tip was also held perpendicular to the entire root canal surface at a distance of 1 mm. NaOCl and EDTA have shown to decrease the Ca/P ratio of the root canal dentin by altering its organic and inorganic components. This alteration might change the microhardness, permeability and solubility characteristics of the root canal dentin, thereby affecting the sealing ability and adhesion of the resin based sealers and decreases the bond strength. , The results of the present study have proven that, 940 nm diode laser when used along with NaOCl and EDTA did not have any effect on the Ca/P ratio of root dentin. Thus, within the limitation of this study, it can be concluded that, a 940 nm diode laser irradiation of root canal dentin along with NaOCl and EDTA irrigation, resulted in better removal of smear layer without significant additional loss of mineral content compared to the use of NaOCl and EDTA alone. 1. Czonstkowsky M, Wilson EG, Holstein FA. The smear layer in endodontics. Dent Clin North Am 1990;34:13-25. 4. Mader CL, Baumgartner JC, Peters DD. Scanning electron microscopic investigation of the smeared layer on root canal walls. J Endod 1984;10:477-83. 5. Byström A, Sundqvist G. Bacteriologic evaluation of the efficacy of mechanical root canal instrumentation in endodontic therapy. Scand J Dent Res 1981;89:321-8. 6. Moorer WR, Wesselink PR. Factors promoting the tissue dissolving capability of sodium hypochlorite. Int Endod J 1982;15:187-96. 7. Yamada RS, Armas A, Goldman M, Lin PS. A scanning electron microscopic comparison of a high volume final flush with several irrigating solutions: Part 3. J Endod 1983;9:137-42. 8. Baumgartner JC, Mader CL. A scanning electron microscopic evaluation of four root canal irrigation regimens. J Endod 1987;13:147-57. 10. Goldman M, Goldman LB, Cavaleri R, Bogis J, Lin PS. The efficacy of several endodontic irrigating solutions: A scanning electron microscopic study: Part 2. J Endod 1982;8:487-92. 11. O′Connell MS, Morgan LA, Beeler WJ, Baumgartner JC. A comparative study of smear layer removal using different salts of EDTA. J Endod 2000;26:739-43. 12. Teixeira CS, Felippe MC, Felippe WT. The effect of application time of EDTA and NaOCl on intracanal smear layer removal: An SEM analysis. Int Endod J 2005;38:285-90. 13. Doðan H, Qalt S. Effects of chelating agents and sodium hypochlorite on mineral content of root dentin. J Endod 2001;27:578-80. 14. Ari H, Erdemir A. Effects of endodontic irrigation solutions on mineral content of root canal dentin using ICP-AES technique. J Endod 2005;31:187-9. 15. Perinka L, Sano H, Hosoda H. Dentin thickness, hardness, and Ca-concentration vs bond strength of dentin adhesives. Dent Mater 1992;8:229-33. 16. Perdigão J, Eiriksson S, Rosa BT, Lopes M, Gomes G. Effect of calcium removal on dentin bond strengths. Quint Int 2001;32:142-6. 17. Takeda FH, Harashima T, Kimura Y, Matsumoto K. A comparative study of the removal of smear layer by three endodontic irrigants and two types of laser. Int Endod J 1999;32:32-9. 18. Saghiri MA, Asgar K, Gutmann JL, Garcia-Godoy F, Ahmadi K, Karamifar K, et al. Effect of laser irradiation on root canal walls after final irrigation with 17% EDTA or BioPure MTAD: X-ray diffraction and SEM analysis. Quint Int 2012;43:e127-34. 19. Wang X, Sun Y, Kimura Y, Kinoshita J, Ishizaki NT, Matsumoto K. Effects of diode laser irradiation on smear layer removal from root canal walls and apical leakage after obturation. Photomed Laser Surg 2005;23:575-81. 20. Marchesan MA, Brugnera-Junior A, Souza-Gabriel AE, Correa-Silva SR, Sousa-Neto MD. Ultrastructural analysis of root canal dentine irradiated with 980-nm diode laser energy at different parameters. Photomed Laser Surg 2008;26:235-40. 21. Alfredo E, Souza-Gabriel AE, Silva SR, Sousa-Neto MD, Brugnera-Junior A, Silva-Sousa YT. Morphological alterations of radicular dentine pretreated with different irrigating solutions and irradiated with 980-nm diode laser. Microsc Res Tech 2009;72:22-7. 22. Gutknecht N, Franzen R, Schippers M, Lampert F. Bactericidal effect of a 980-nm diode laser in the root canal wall dentin of bovine teeth. J Clin Laser Med Surg 2004;22:9-13. 23. Stabholz A, Sahar-Helft S, Moshonov J. Lasers in endodontics. Dent Clin North Am 2004;48:809-32. 24. Schoop U, Kluger W, Dervisbegovic S, Goharkhay K, Wernisch J, Georgopoulos A, et al. Innovative wavelengths in endodontic treatment. Lasers Surg Med 2006;38:624-30. 25. Pradhan S, Karnik R. Temperature rise in external root surface during laser endodontic therapy using 940 nm diode laser: an in vitro study: Int J laser Dent 2011;1:29-35. 26. Rome WJ, Doran JE, Walker WA 3 rd . The effectiveness of Gly-Oxide and sodium hypochlorite in preventing smear layer formation. J Endod 1985;11:281-8. 27. Coluzzi DJ. An overview of laser wavelengths used in dentistry. Dent Clin North Am 2000;44:753-65. 28. Hibst R, Keller U. Experimental studies of the application of the Er: YAG laser on dental hard substances: I. Measurement of the ablation rate. Lasers Surg Med 1989;9:338-44. 29. Moritz A, Schoop U, Kluger W, Jakolitsch S, Sperr W. Lasers in endodontics. J Oral Laser App 2001;1:87-95. 30. de Souza EB, Cai S, Simionato MR, Lage-Marques JL. High-power diode laser in the disinfection in depth of the root canal dentin. Oral Surg Oral Med Oral Pathol Oral Radiol Endod 2008;106:e68-72. 31. Alfredo E, Silva SR, Ozório JE, Sousa-Neto MD, Brugnera-Júnior A, Silva-Sousa YT. Bond strength of AH Plus and Epiphany sealers on root dentine irradiated with 980 nm diode laser. Int Endod J 2008;41:733-40. 32. White RR, Goldman M, Lin PS. The influence of the smeared layer upon dentinal tubule penetration by plastic filling materials. J Endod 1984;10:558-62. 33. Niemz MH. Laser Tissue Interactions: Fundamentals and Applications. 3rd ed, Springer News; 2007. p. 80. 34. Saleh IM, Ruyter IE, Haapasalo M, Ørstavik D. The effects of dentine pretreatment on the adhesion of root-canal sealers. Int Endod J 2002;35:859-66.